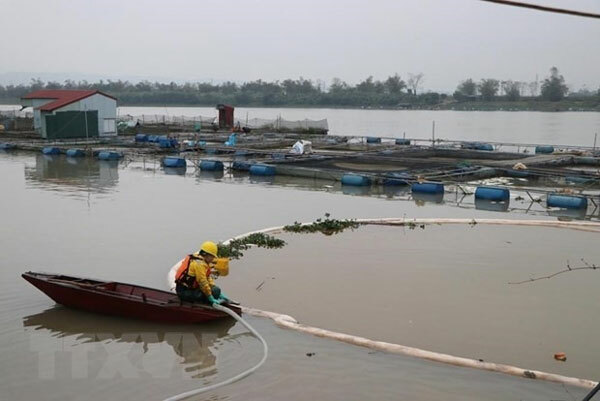 VietNamNet Bridge – About 85 per cent of an oil spill from a sunken floating fuel station in Hai Duong Province’s Nam Sach District has been recovered, local authorities said. On Sunday, local agencies took measures to minimise the negative impact of the oil spill. The incident was reported to have occurred at 4.30pm on Friday in Nam Hung Commune. The floating fuel station owned by a local family overturned and sank on a section of Kinh Thay River running through Nam Tan Commune, Nam Sach District. The station was salvaged at 11pm the same day. According to Pham Van Son, director of the Environmental Incident Response Centre, the rescue unit has recovered 85 per cent of the spilled oil. The rest was still in duckweed and fish cages. “We will continue to deal with the remaining oil, and will guide local residents to recover the fuel by other means," Sơn told vietnamplus.vn. Local fish breeding farmers have used pumps to push the oil out of the fish cage areas and also provided oxygen for the fish. They were also provided with materials to absorb oil in order to prevent environmental pollution. Nguyen Van Thuan, from Nam Tan Commune, said his family used blankets to absorb oil and increased oxygen for their fish. The incident did not harm people but threatened to affect local fish farmers. According to Thuan, fish in the cages have not been affected but his family and many other fish-raising households are concerned it will affect the growth of fish in the long term if the incident is not handled thoroughly.